For my son’s first birthday I had a Fun in the Sun theme. 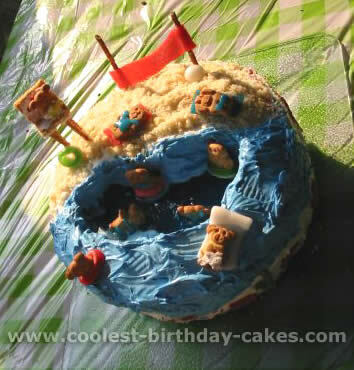 So I thought it would be fitting to have an ocean cake. My husband made a cake bored for me that had a moat around the center cake. I used eight cake mixes for the entire cake. For the sand castle part I bought a cake mold. Around the sand castle I used blue Jell-O and put gummies fish in it to look like water. For the beach part I found some candied strips that worked for beach towels then some chocolate balls for beach balls. I lucked out and found some beach character that I also placed around the cake. I iced the cake with butter cream icing that I tinted sand color, and then sprinkled organic raw sugar all over it to give it a sand texture. It was a simple cake with a lot of reactions. 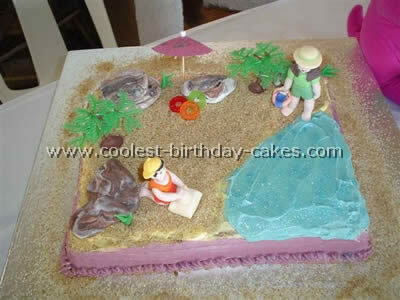 The idea for the Barney Beach Party cake came from the Barney DVD "Beach Party" .Mikayla my two year old daughter is crazy about Barney, she practically eats sleeps and drinks Barney so I decided to make a unique birthday cake from a picture I found on the internet of the beach party. I was so excited about making this cake that I actually surprised myself when I finished decorating it. I love baking and this was a challenge as moms like to have the very best for their kids’ parties. I used an oven tray to bake the cake in it was a vanilla sponge cake 30cm x 25cm it was just one layer. To ice the cake I used stork margarine and icing sugar and added red & blue food liquid coloring to produce the purple icing. It worked like a dream and then I also made some blue light blue icing for the water/sea and put some blue sparkles for the shimmer effect of the water. For the sand I used a light brown and caramel brown sugar which I mixed together to get the color of the sand to resemble that of the beach. I bought some plastic trees and a paper umbrella like the ones used in cocktail drinks. For the swimming rings I used jelly rings you could also use life saver sweets. The figures and rocks I bought from a lady who makes these figures out of sugar paste. I sprinkled some of the sugar/sand on the cake board as an added extra to this unique birthday cake. This unique birthday cake idea came from another website. I decided to do this for my son’s first birthday as he loves playing in the ocean! The cake was not hard to do but it was time consuming. Believe it or not the most difficult thing was finding all of the appropriate candies for the cake. I had a hard time finding green fruit roll-ups and a really difficult time finding striped gum (used for towels). I had fun decorating the teddy bears but it was a bit tedious. This was absolutely worth the effort though it has already set the bar pretty high for this year! Happy Baking! I had so much fun making this unique birthday cake for my son’s birthday. 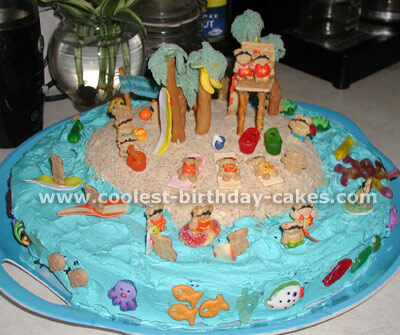 I initially got the idea from Woman’s Day magazine (online) and from viewing the different beach cakes on this site which are all wonderful. The ocean is made with Berry Blue Jell-O. 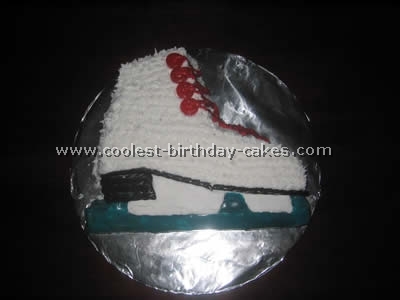 Be sure to ice the entire inside of the cut out area before the liquid is poured in otherwise it will seep into the cake. 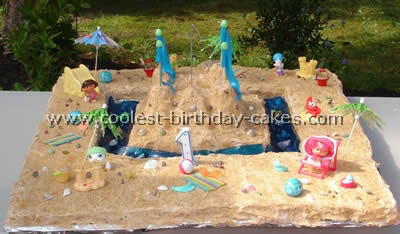 The beach is made with graham cracker crumbs and the teddy grahams were decorated with icing gel. Some of the bears are lying on towels made of fruit roll-ups. The green reeds on the side of the cake were made with sour apple sticks which I cut up and shaped. I sprinkled the blue iced portions with white Wilton cake sparkles. I prepared this entire cake the night before. The only word of caution would be that the portions of the teddy grahams that touched the jello (i.e. the two in the life preservers and the one that was swimming) turned mushy by the time I served the cake even though they looked perfectly fine. The reactions that I got from everyone who saw the cake made it worth the effort! My friend was having a Jamaican theme graduation party and I was not sure what to make (I wanted a unique birthday cake). So when I think of Jamaica, I think…Beach! The water is made of blue frosting and Jell-O. The sand is crushed graham crackers. 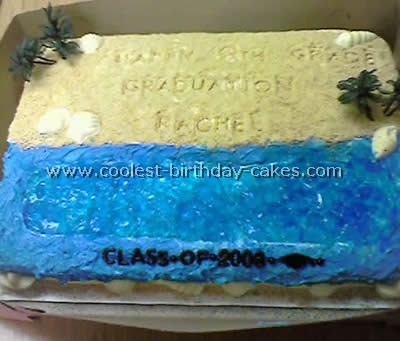 I made the shells out of white chocolate put into shell molds; I then pushed plastic letters into the frosting to make it look like the lettering was written in the sand. The palm trees were plastic bought from the party store. To celebrate my daughter’s 5th Birthday, we had a Luau/Beach party. The cake was VERY simple to make. 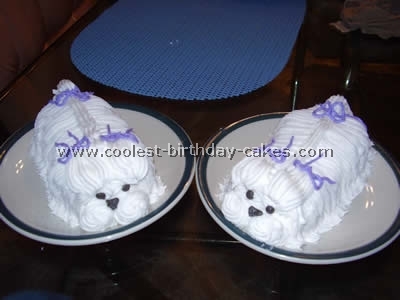 Basic packaged cake and icing sugar recipes used. I first made a chocolate cake, using a rectangle 2L pan and then a vanilla cake, using a 1.5L loaf pan. I cut the vanilla loaf and lined up 1/4 on top and 3/4 to the side of the chocolate cake. In the remaining areas on the edge, I lined up mini chocolate chip cookies (bought in bulk at the grocery store) and layered them with icing. I dyed the icing and spread green on the vanilla cake and blue on the chocolate cake. I crushed the leftover cookies and sprinkled it on to make sand. 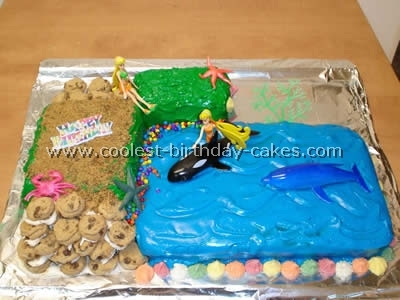 I placed colourful candy-coated extra mini chips along the edge on the 2 cakes, mint chocolate pastel coloured shells along the bottom of the cake and used various ocean creatures found at the Dollar store, and lastly included 2 mini girl figures to satisfy my daughter’s need for everything of hers to be feminine. She thought it was a really unique birthday cake! I got this unique birthday cake idea from the web. I made it for my daughter’s 3rd birthday and had so much fun making it. I used a 13×9 pan for the cake, torted it, and filled it with chocolate buttercream. I also added chocolate buttercream on the sandy part and covered it with graham crumbs. Water was blue piping gel. All props were purchased except for the fondant flowers. This unique birthday cake was yummy and my daughter loved it. I took a very unique birthday cake recipe and made a large round cake as the bottom. I then made a smaller cake in a metal bowl and sliced off the top for the island. 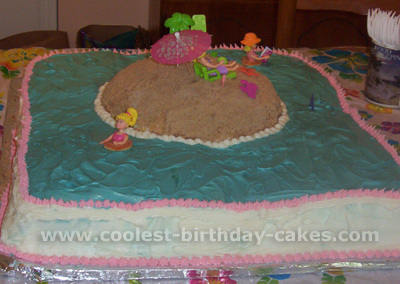 I first frosted the water with blue frosting, then I frosted the island and added crunched up vanilla wafers for the sand. I decorated teddy grams in a variety of little bathing suits using powdered sugar frosting (water and powdered sugar and food coloring). I found that a tiny paintbrush and/or toothpick worked well. I found a variety of ocean gummy candies for the sea creatures. 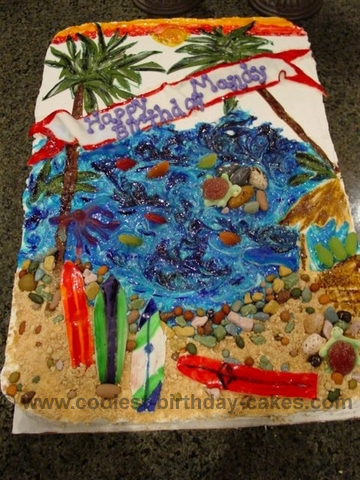 I used fruit roll ups and other fruit roll type candies for the surfboards and towels. The gummy O’s can be used as blow up rings. I used gumballs as beach balls and the palm trees are tootsie rolls with a toothpick pushed threw them for stability. Then you just cut the green apple fruit rolls into trees. I made the life guard station out of pretzels and graham crackers held together by frosting. 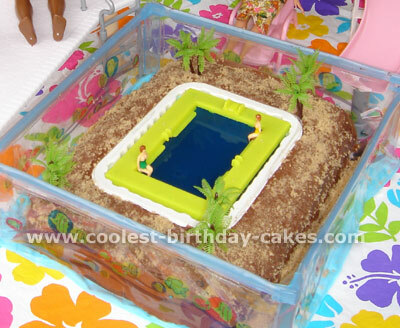 The volleyball court is made of pretzels and fruit roll. The best tip for creating a unique birthday cake is- use your imagination. It was a great success. I had seen teddy grahams decorated on all sorts of cakes and even swimming pool cakes. I came up with the island myself and just ran with it. It is a really fun unique birthday cake! I’d recommend not making this cake on the hottest day of the year!! We were having a summer themed birthday party, I got the idea from a website and then expanded on it. There were two cakes on top of one another (chocolate and vanilla, so that people had the choice of which cake to have) and I frosted the entire cake white to begin with. I cut out a kidney bean shape out of the cake, crushed up pecan sandies for the sand side of the cake, and then sprinkled them on the cake. I made blue Jello for the water that filled in the hole (make sure that this is frosted before filling with Jello). 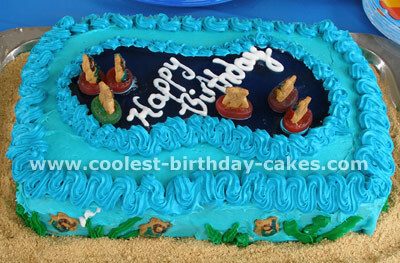 I mixed the blue frosting and created "waves" in it for the waterside. Along the sides of the cake I used Swedish fish and cut up green Airheads to make seaweed. The teddy graham bears (actually a no-named brand I bought which were a little bigger) are decorated with icing and gummy lifesavers. The lifeguard is sitting up on a graham cracker chair placed on cut up pretzels. The volleyball net is an Airhead wrapped around pretzels (the ball is a gum ball). I came up with this unique birthday cake idea on my own, it was for my mothers 44th Birthday. 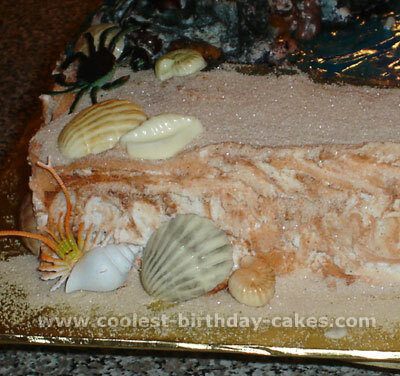 I baked a 1/2-sheet cake, and sliced the top part off of half of it to make the slope down from the beach to the water. I saved that cake and shaped it for the wall of rocks on the left side and iced the cake with a thin layer of butter cream (I used Wiltons recipe). For this unique birthday cake use 2 different shades of blue piping gel for the water, spread it on with a spatula going over it with the darker blue so it looks like water. I pushed candy rocks into the wall of the unique birthday cake and used icing like putty going around each rock kind of gluing it in place with the icing. I airbrushed the rock pile with black and brown, and airbrushed the beach in brown, then mixed granulated sugar with a little bit of ground cinnamon for sand. For the pier I bought a 3/4” dowel at home depot and cut it into 6 pieces, and another piece of wood into pieces for the walk way. I used a hot glue gun to glue them together and bought some rope to tie around the poles. I rubbed a little black and brown paint on the pier to make it look more realistic. Last but not least, buy a few little fish/dolphins to put in the water of the unique birthday cake. 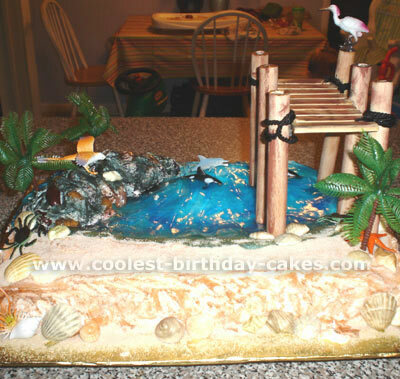 You can also put some little starfish, crabs, etc., to put around the unique birthday cake. I made shells of white chocolate and used petal dust to color them. This unique birthday cake was a lot of work but it turned out great!! This unique birthday cake was created for my niece’s birthday party. She had just returned home from Hawaii and wanted to carry on the fun. The cake decoration was inspired by her birthday invitation. I first made a chocolate cake (any sheet size will work). The cake was frosted and filled with buttercream icing. The surfboards, palm trees, hut and sign were made from rolled fondant. I went to my local candy store to purchase the candy rocks, gummy fish, shark, turtles, octopus, and pineapples and made the sand from crushed cinnamon bears. The water was created with clear piping gel with just a touch of blue color and then swirled a bit to give the illusion of some salty water throughout. The best part is that this entire unique birthday cake is edible.